Setting up your Sidebar in Windows Vista allows you to display the Sidebar in a specific location on your computer. Your Sidebar in Windows Vista is a valuable tool that allows you to access specific information, such as weather, time, the calendar, or your favorite Sudoku game, in an instant without a lot of flipping through windows. 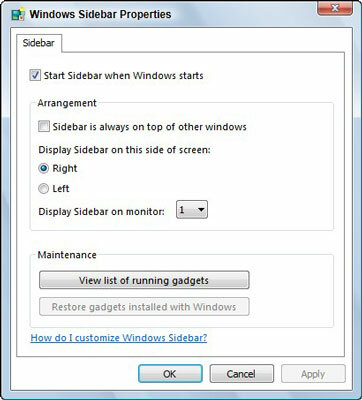 Get your Sidebar for Windows Vista set up by following these steps. 1Right-click the Windows Sidebar icon. You can find the Windows Sidebar icon on the Windows taskbar. Choosing Properties opens the Windows Sidebar Properties dialog box. 3Select the Sidebar Is Always on Top of Other Windows check box and click OK. If you like, you can also enable Start Sidebar When Windows Starts to ensure that the Sidebar always displays when you start your computer. 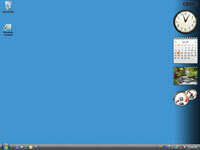 Clicking Close will close the Control Panel window, and the Sidebar will appear.